According to the Internal Revenue Code Section 1031, an investor can defer capital gains tax and depreciation recapture by reinvesting the proceeds from the sale of investment property into replacement property, thus preserving significant wealth in their estate. What Are the Risks of a 1031 Exchange? If the strict timeline and procedural rules are not followed, the 1031 exchange may be disqualified. Also, there is no guarantee that the IRS will approve each individual exchange, nor that tax law will not be altered in the future. A Delaware Statutory Trust (DST) is a separate legal entity created as a trust under Delaware statutory law, which permits a very flexible approach to the design and operation of the entity. What Are the Risks of a DST? The risks of investing in a DST include but are not limited to: the risk of relying upon the program sponsor and their continued competency and success; the risk of sponsor insolvency; and the risks associated with giving complete discretion regarding the management, leasing or disposition of the property to a third party. What is a Tenant-in-Common (TIC)? Tenancy in common is a co-ownership structure under which multiple investors pool their funds to own one entire property. Each investor owns an undivided fractional interest in an entire property and participates in a proportionate share of the net income, tax shelters, and growth. What Are the Risks of a TIC? In addition to all the risks of investment real estate, owning real estate in common entails the risk of disagreement or conflict with the other tenants as to the management, financing or sale of the property. Unanimity among the tenants is required for all major decisions. What is the Difference Between a DST and a TIC? View a DST vs TIC Comparison Chart. Do DSTs and TICs Qualify as Replacement Properties in a 1031 Exchange? Both DSTs and TICs can be structured to qualify as replacement properties for a 1031 exchange according to Revenue Ruling 2004-86. A complete tax opinion is included in the Private Placement Memorandum (PPM) for each DST or TIC. Securitized real estate is real estate that is packaged and sold as a security and is therefore regulated by federal securities legislation enacted to promote fuller disclosures and provide for more suitable investments for the investor. What is an Alternative or Direct Investment? Alternative investments are private placement offerings, available to accredited investors, not eligible for 1031 exchange . These include Private Real Estate Investment Trusts (REITs), real estate funds, energy-based investments, and triple net leased properties. They are not publicly traded and should be considered illiquid investments. The Security and Exchange Commission defines an accredited investor as an individual with either $1 million in net worth (all assets, excluding primary residence, less all liabilities) or net income for the last two years of $200,000 or greater ($300,000 if spouse has income) with a reasonable expectation of such earnings in the current year. Why is Registration required to view DST and TIC offerings? Companies may not advertise these types of security offerings to the general public. Generally, companies may give information to potential investors only if there is a "substantive, pre-existing relationship." 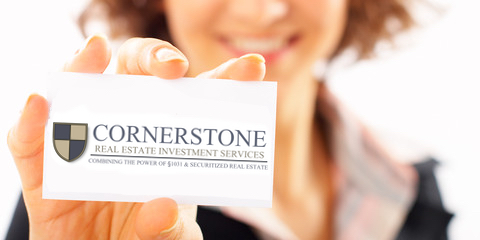 Cornerstone uses the registration process, including initial contact from a Cornerstone representative, to establish the required pre-existing relationship.